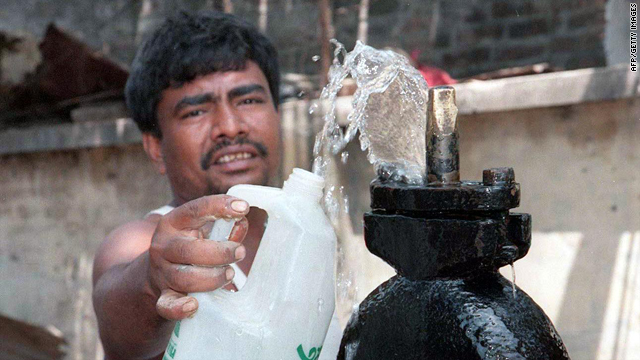 A new study published in British medical journal The Lancet says that up to 77 million people in Bangladesh are being exposed to toxic levels of arsenic. WHO calls its "largest mass poisoning of a population in history"
(CNN) -- It could be the worst mass poisoning in history. And the terrible irony is that it may all be due to an idealistic push to clean up drinking water for some of the world's poorest people. A new study published in British medical journal The Lancet says that up to 77 million people in Bangladesh are being exposed to toxic levels of arsenic, potentially taking years or decades off their lives. An international team of researchers from Chicago, New York and Bangladesh followed 12,000 people over the past decade, monitoring their arsenic intake and mortality rates from contaminated wells. By the end of the study, one in five deaths were determined to be directly related to elevated arsenic levels in their system. Stretch that over the entire population that takes its water from wells, and the impact is daunting. The problem has been known about for years, if not the overall deadly impact. Video: Largest mass poisoning in history? As far back as a decade ago, the World Health Organization called it "the largest mass poisoning of a population in history... beyond the accidents at Bhopal, India, in 1984, and Chernobyl, Ukraine, in 1986." Well-meaning development groups had encouraged remote villages across Bangladesh to dig wells over the past decades, rather than rely on potentially contaminated surface water and dirty rivers. But now potentially a much worse problem has been found far below the surface. Arsenic is a deadly poison with a history of use in intrigue and assassination. Some have even theorized that Napoleon Bonaparte succumbed to long term poisoning with the substance by his enemies while in exile on the island of St. Helena. But the element and its derivatives are also used in many industries, such as metal smelting and as a component in products ranging from insecticide to micro-chips. And unfortunately, it is also found in abundance in the soil and rock in Bangladesh. It's leached up through the water table in tens of millions of water wells across the country. The study showed that the top quarter of those exposed had a 70 percent higher mortality rate than would be expected in the population as a whole. The authors hope for more study, and a long term plan to deal with the damage already done. But a solution for those already poisoned may remain decades away. Other long term health studies have shown it takes 20 years for the negative morbidity effects of arsenic poisoning to dissipate, even after they stopped using contaminated wells.